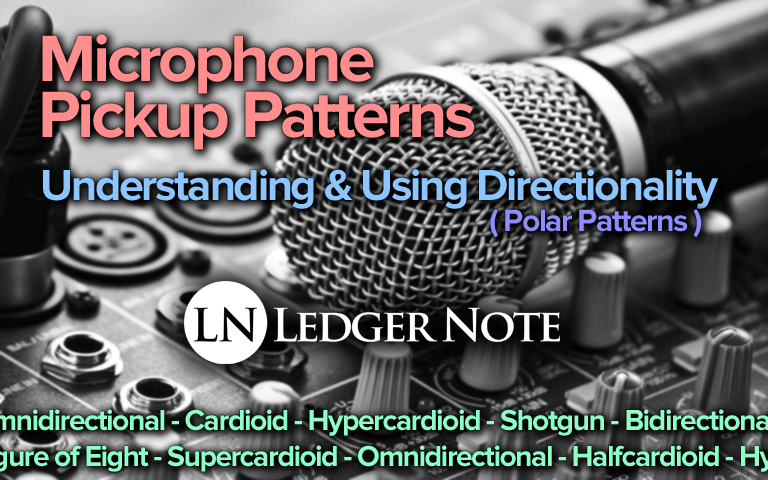 Just like there are types of microphones, there are varying microphone pickup patterns in each type. Some mic's even let you change this polar pattern with a switch on the back. To make it even worse, you'll hear this property called all types of names including this third term in this article already: directionality. So what's the deal? Why do these options exist and what purpose do they serve? We'll clear up all of the confusion for you right now. Imagine this scenario: you have a bluegrass band that has four members and they want to record live with all four members. So you make them stand at the four points of a square facing each other so they can jive off each other's energy. You go for close miking on each band member to isolate each sound the best you can for mixing purposes. This isn't a complicated topic, but there are a lot of strange terminology you might not have heard of. However, they all play off of each other with different prefixes so you won't find it hard to remember them all if you can remember one. Let's explain what each term from the list above is talking about, and then we'll give you a visual example of each type of pickup pattern. After that, it'll click and you'll never forget. 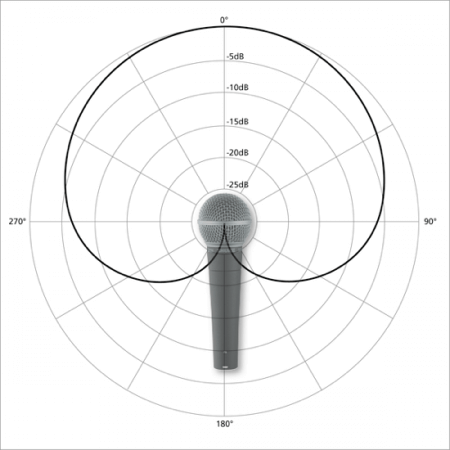 The directionality of a microphone refers to its capacity to record from various directions. One microphone may be most sensitive to sound coming from the front while another might be sensitive to sounds coming from front and the back. Some microphones can record sounds at equal volumes from all directions. You can see how this could really destroy a recording if you aren't aware of the directionality property of each microphone you're using. Don't freak! All you need to do is yank the prefix off of the word "directional" and it'll become obvious from which direction each type of directionality above records. These prefixes are all from Latin and you've likely encountered at least two of them and know what they mean. But for sake of completion let me explain them. Uni- means "one." 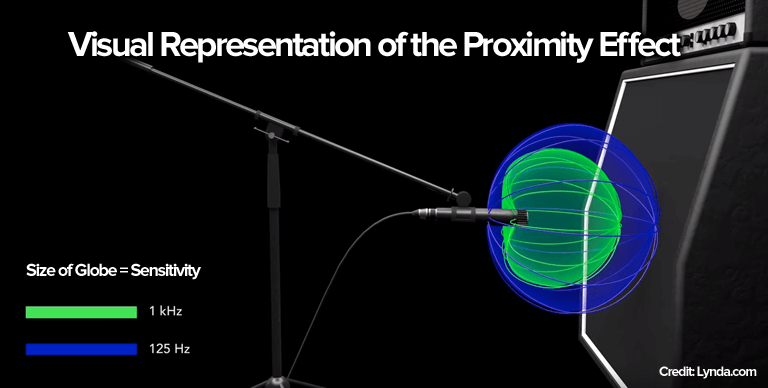 So a unidirectional microphone will record sounds from one direction (in front of it). Bi- means "two." This means that a bidirectional microphone will pick up sounds from two directions (always opposite directions). Omni- means "all" or "every." 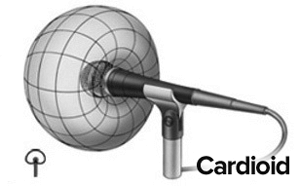 It follows then that an omnidirectional microphone will record sounds from all directions with equal sensitivity. Again, all microphone pickup patterns will fall into one of the above categories. But they will vary in sensitivity, so it is useful for the recording engineer to be familiar with the conventional polar pattern graphs that correspond to each pickup pattern. What you see above is a cardioid polar pattern emanating from what looks like a Shure SM58 dynamic microphone. The cardioid polar pattern is overlaid on a polar graph featuring concentric circles that represent 5 decibels in sensitivity as you move outward. The dark black cardioid pattern reaches 0dB at zero degrees. This means that directly in front of the microphone the sensitivity is the strongest. You'll notice that at 90 degrees and 270 degrees the microphone is still capable of recording sounds. The sensitivity is less at those angles, though, and is increasingly less as you move behind the mic. At exactly 180 degrees (perfectly behind the mic) no sound will be recorded. Four more common polar patterns. Hopefully now you get the idea. If not, I have failed. Regardless, we continue. In my mind, when you take the concept of directionality and combine it with the specificity of polar patterns, you arrive at the final overview, which is the pickup pattern. These various terms all explain this same idea in different manners and levels of detail. Some will argue that the differences I'm pointing out in the terms aren't even real, but I do think it helps build the concept in a linear manner. Ultimately, by slowly introducing you to increasing levels of detail, you have been prepared to witness and understand the full three-dimensional graphics of the pickup patterns. The symbols above may be found on the box, documentation, or engraved on the microphone's casing itself. This should help you quickly identify the pickup pattern of whatever microphone you're using at the time. With that said, let's take a close look at some of the 3D pickup pattern images so we can really understand how this functions in real life. By reading through the uses, notes, and general ideas behind each of the following patterns, you can understand all of the others as well. Cardioid shares the same origin and refers to the term "heart" to explain it's shape on the polar graph. They are unidirectional, being most sensitive from the front but have a wide "listening" angle to accommodate the movement the vocalist or instrumentalist. In most environments but especially in a controlled acoustic environment, it does a fantastic job of isolating the source and blocking out unwanted sounds. This pattern should be used to capture a single source situated in front of the microphone, especially when ambient sounds should not be included in the signal. This is your general use pickup pattern, perfect for handheld mic's, live performance, and studio recording. 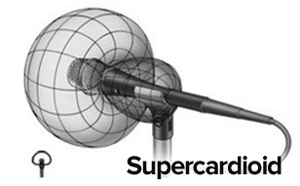 There are many types of cardioid pickup patterns, including supercardioid, halfcardioid, and hypercardioid. Typically only found in large diaphragm condensers and ribbon microphones, the figure of eight polar pattern will record sounds from the front and back but reject sounds from the side. It is of a bidirectional directionality and isn't often used in studio recording. It could be used to record two vocalists standing face to face but you're better off using two cardioids. However, this is perfect for a live television discussion where lapel microphones might cause issues. 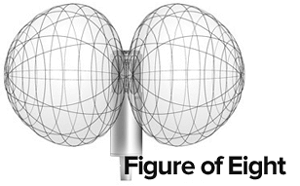 Any application where you're tempted to use one of these, explore using two cardioids in isolation instead first. These have more use in live situations than in the recording studio, but even then separating sources into their own mic's is preferable. 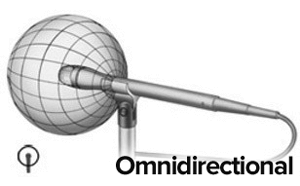 An omnidirectional microphone accepts sound from every direction and therefore doesn't require being pointed anywhere. You can set and forget it. In a recording studio environment, these work well for groups or choirs. The problem is that they are monophonic instead of stereo. They work well for lapel microphones where the source is very close to the mic, but in general they will only be a nuisance due to their inability to be aimed away from unwanted ambient noise. Unless the mic is close to the source where gain can be lowered, you'll likely encounter feedback and other unwanted noises sneaking in from every direction. These can work fantastically to record ambient sound in a forest, in the middle of a wrestling or football arena, etc. They have great application for sound engineers outside of the recording studio. The difference between this pickup pattern and that of cardioid is that it has an even more narrow focus of sensitivity. However, the consequence of this is that it will also pick up some sound from directly behind the microphone. They pick up much less ambient sound in the signal unless it comes from directly behind. To deal with the sound coming from behind, you can turn up the gain so that the source in front is much louder in the signal than any ambience. Place your stage monitors or other sounds around 105 degrees and 255 degrees in the dead zone off to the sides to avoid feedback in high gain situations such as live performance. The examples above should allow you to work through the rest of the pickup patterns logically now. However, there are a few special cases I want to point out to you that you'll encounter. Some of the best studio microphones with switches on the back that allow you to change directionality and polar patterns. 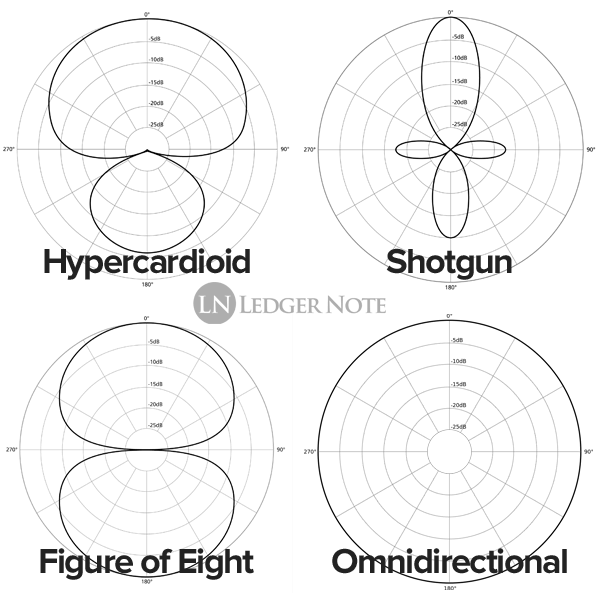 You might be able to switch from a cardioid pattern over to a shotgun or omnidirectional pattern. In my mind, these aren't preferable to use in a studio environment. A jack-of-all-trades mic will be the master of none, while a dedicated microphone will have research and development behind it to make sure it performs under the conditions it was designed for as well as possible. Some video camera microphones will have these types of variable directionality switches on them in order to narrow your sensitivity during zooms. Some will even alter themselves automatically as you zoom in to the desired source. In your adventures, you'll hear of or work with X-Y microphones and stereo pairs. These are almost always cardioid microphones meant to capture one source but provide a stereo spread. This works well for piano, acoustic guitar, and other stringed instruments that perform as leads in a sparse mix. They are created to not suffer from phase issues that you might deal with if you can't properly set up your own pair of microphones. While I'll only mention this in passing here so you're aware of it, you can read our full exploration of the proximity effect for deeper information. What you'll want to know here is that all cardioid-type pickup patterns will exhibit what is called the proximity effect. This means that the effect occurs at an increasingly greater strength the closer the microphone gets to the source. The effect is that there is an increased sensitivity in bass frequencies. Cardioid-type microphones are the preferable option for close miking, but people take that too literally at times without knowing about this effect. Vocalists and radio personalities will take advantage of this effect by "eating the mic." This gives them a bassier, warmer tone to their voice. Combine this with heavy compression and you get that "radio DJ" sound. If you read closely in order to gain an even basic understanding of microphone pickup patterns (there's no need to explore it any deeper than this!) then you now are ready to deal with any live or studio situation that might pop up. It serves you well to be aware of all of the options and terms associated with all of this, but the reality is that 99% of the time as a recording engineer in a studio, you're going to be using a regular cardioid polar pattern in a unidirectional microphone (or two in a stereo pair or an X-Y mic pair). As a live stage engineer or sound engineer for movies and television, you'll definitely end up dealing with other options. Know about it so you can take advantage of any job opportunity that pops up and do a good job!